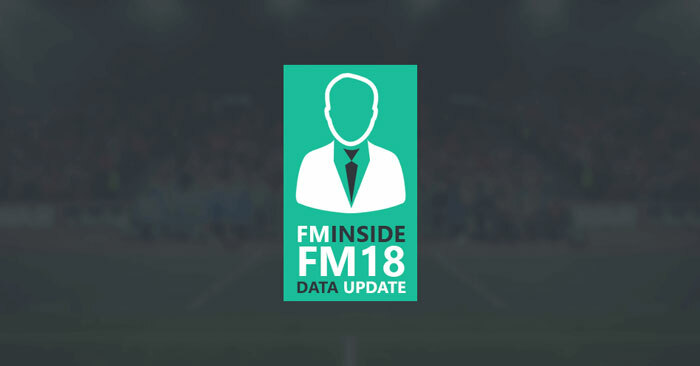 FMInside Transfer Update Final FM18 version! FMInside is going next level with our latest update! Forget the 2017/2018 season because this is update gets you ready for the 2018/2019 season and it is like if you are playing FM19! FMInside is going next level with our latest update! Forget the 2017/2018 season because this is update gets you ready for the 2018/2019 season! We have completely overhauled the games database and created the first full compatible data update for the coming 2018/2019 season. This is it! The final version of our FM18 transfer update! For months did we post new versions of the Football Manager 2018 Transfer Update and now publish one last update for FM18. What is in the final version of our Football Manager 2018 transfer update? Download the update by clicking the download button. If the editor data folder doesn’t exist you can create it yourself. Open FM2018 and start a new career and select the 18.3 database. After selecting your database make sure the FMInside Data Update is selected. Pick your nations, pick your leagues and start the game! *IMPORTANT! Make sure to delete older versions of the update from the editor data folder. The update will be corrupted if you do not delete the old files. Be aware that using multiple Data Updates simultaneously could result in unexpected errors, corrupted data and crashes. Discussion: FMInside Transfer Update Final FM18 version! 85 comments have been posted so far. in the new update the Italian B series is 22 teams and not 19 teams as it should be. Yes! We hve just uploaded our final update of the FM18 season! @geoff001 not sure i know what you mean? i love this database, but im curious how you can guess the attribute of the player, thanks. Thank you for the input Joao, we will take this into our next updates (where possible). Sporting CP president is Frederico Varandas. Douglas Aurélio isn't on Sporting CP he was transferred to Belenenses and he his playing in their U-23 team for now. Sporting CP doesn't have a B team anymore, they have a U-23 team that plays in a U-23 league created this year. Per example SL Benfica has both a U-23 team and a B team. I've noticed there is an issue with registering Euro squads for Scotland. I get no message about it and first game comes around and I have to use greyed out players to play the game. @ForeverStallone > Not yet, it was confirmed after our release! But I have confirmation from our updater that this will be in our next release this Friday. Does this include Ronaldo takover at Reakl Valladolid?? My game crashes after the updated db anyone else? This isnt updated.... No Dendonker at Wolves, Mina at Everton, no Courtois etc??? good evening I can not get the new update of 09/08 with Mina and Gomes at Everton? Could you help me put San Marino Calcio in the Serie C or some DataBase with it please? will a update be realesed soon? Is there a version of this database compatible with FM Touch? Please update the Argentine League transfers.